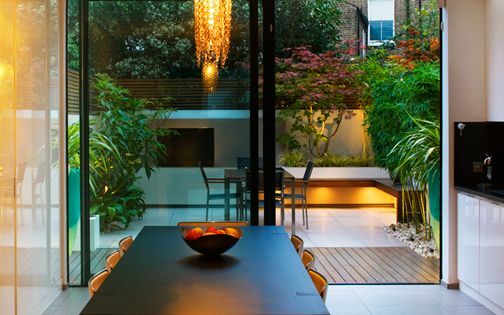 In this small contemporary back garden, we conserved the beauty of its old textured walls, and merged a sparse natural material palette and a distinct woodland ambience with multilayered leafiness, amid sheer outdoor surface clarity. 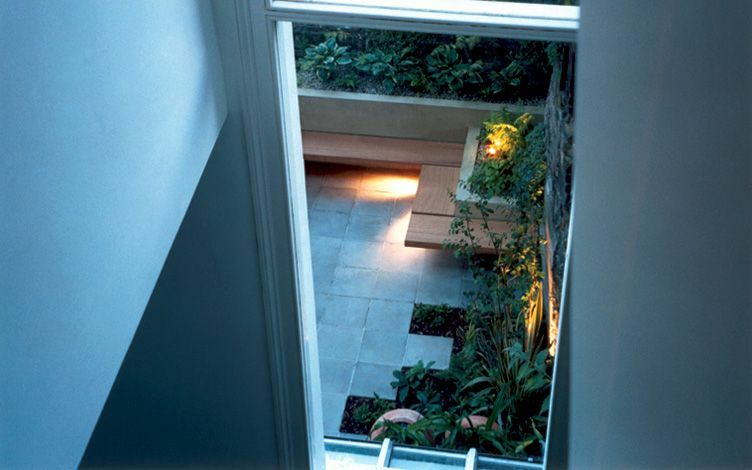 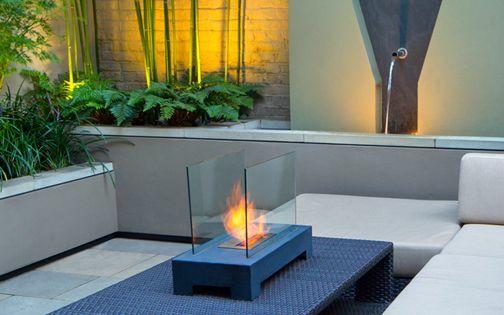 A minimalist garden design formed an underlying architectural element in this Central London townhouse renovation, where blue sandstone matches its interior floor, creating a deeper sense of space. 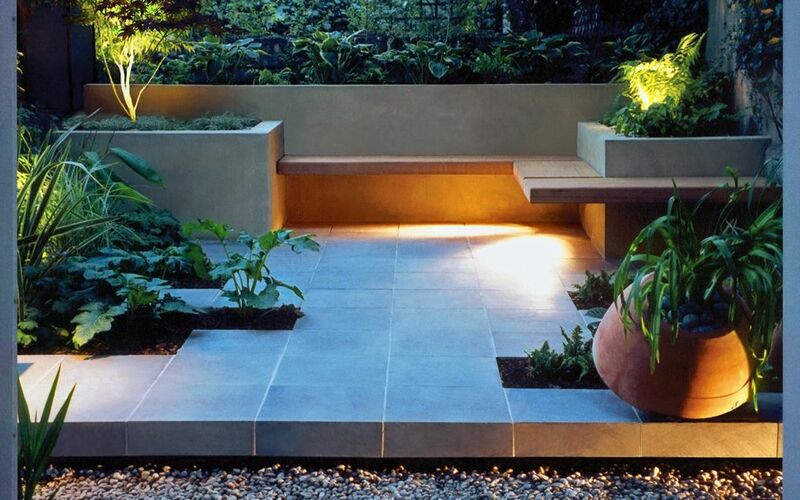 The step's front edge was quarried at full height, generating a minimalist floating detail, set along a perfect grid of interlocking, reciprocal design patterns. 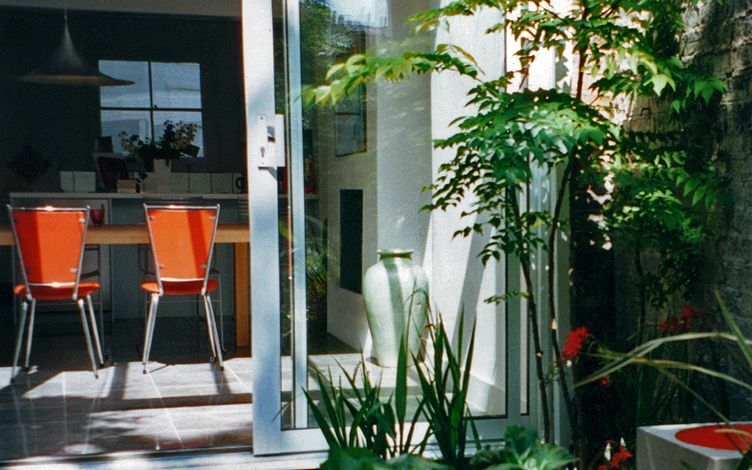 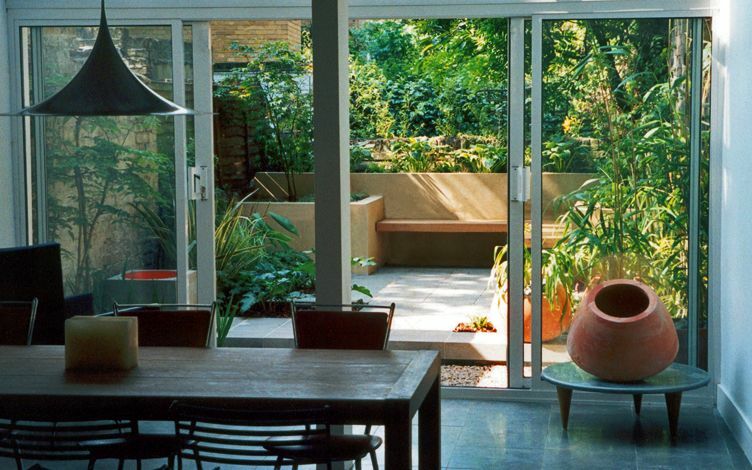 This pocket-sized garden is tucked away behind a grand extension, where a major renovation had carved out a subterranean open-plan kitchen with a scant exterior space. 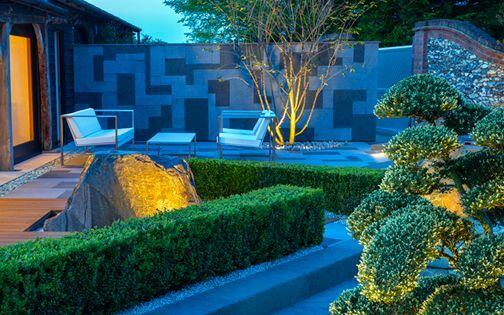 The home's interior was surfaced in 400 x 400mm stone, and we sought to follow its layout, not only in size and pattern, but also in tonal expressions, to articulate a fluid minimalist garden design. 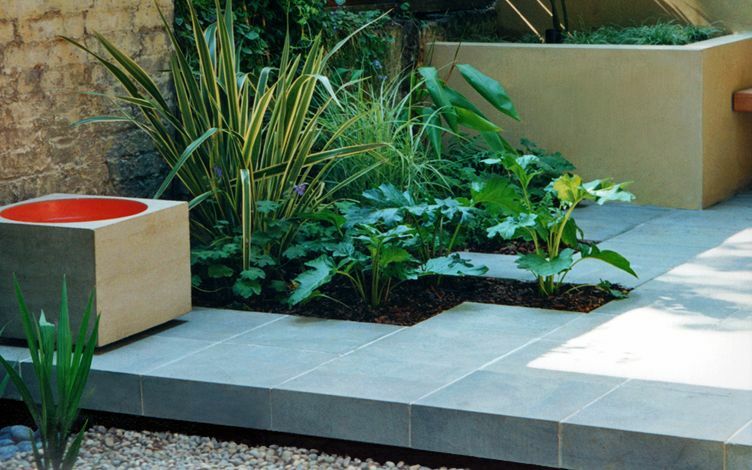 We utilised smooth, square blue sandstone for paving, while several sections were quarried at 110mm height to enable a robust step detail with a floating 40mm shadow plinth. 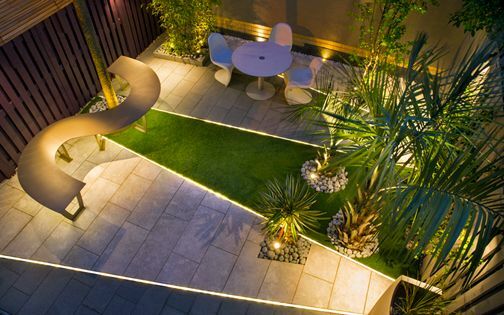 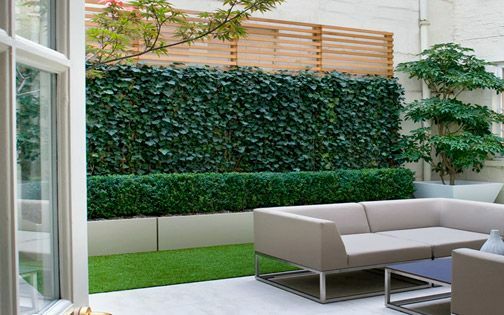 This unfussy design approach sets the backdrop for a naturalistic planting scheme, defined by pure urban garden ambience – pivotally extending a compact outdoor space along an interconnected, clean-lined grid. 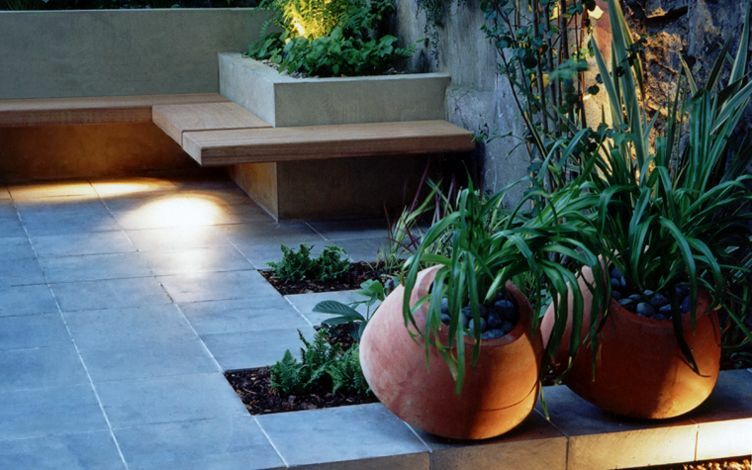 Acanthus foliage, slanting terracotta pots and warm outdoor lighting produce detailed nuances above the step's sturdiness, where a layer of beach pebbles defines respite between smooth garden pavers and an opulent kitchen, adding further textural depth. 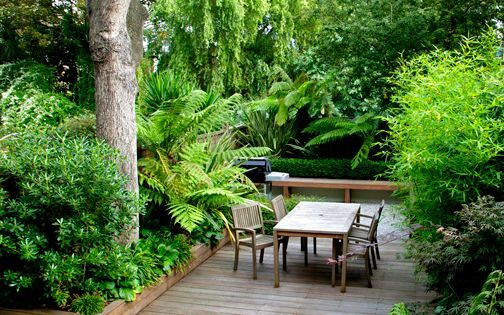 The sparseness of ingredients, spurred on by low-key landscape design ideas, narrates a balanced lyricism in this tranquil, intimate small garden. 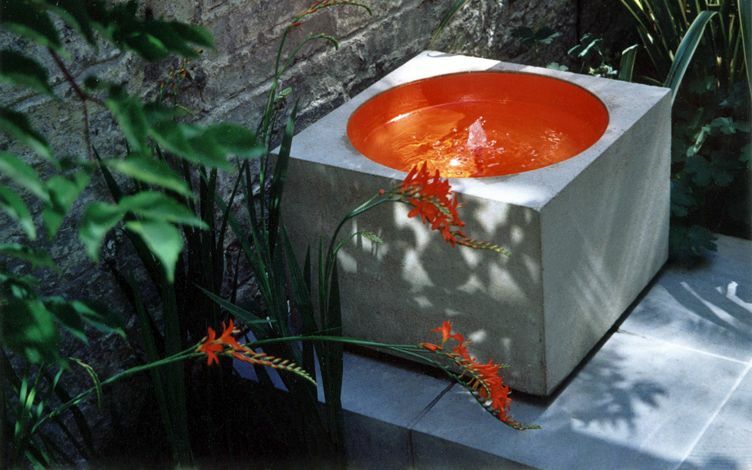 A minimalist water feature was specially commissioned for the project; its square concrete form, softened in a gold leaf finish, is playfully repeated by vibrant Crocosmia petals, alongside multidimensional, rendered raised beds. 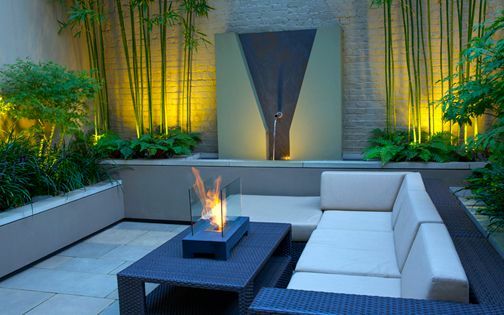 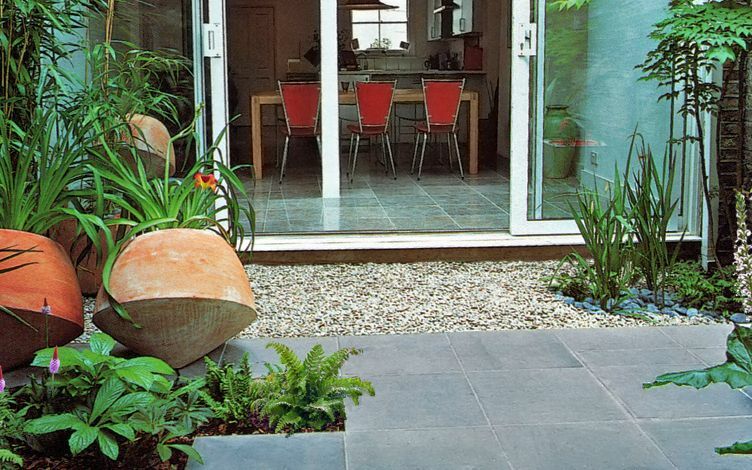 This surface distinction creates a tactile transition from interior into outdoor space, where lush foliage plants sprawl in sheer contrast to hardscape simplicity, within a diversely layered planting scheme. 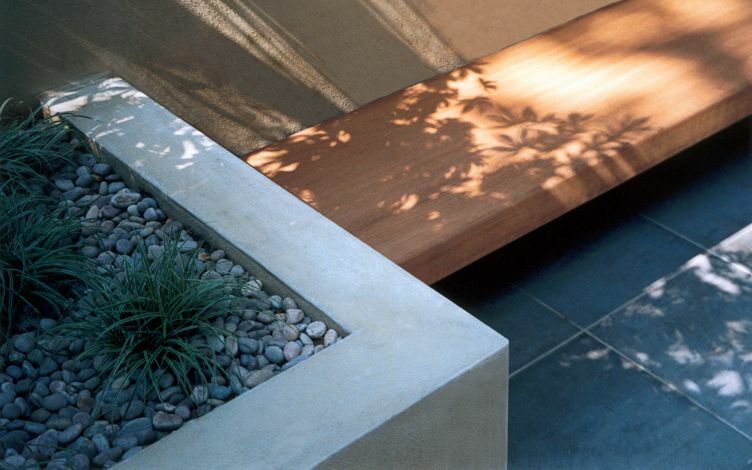 A cantilevered bench features three Iroko hardwood sections; its 80mm-high solid profile reiterates the stone step's copious density, where steel beams were fitted into concrete walls, joined by cavities in wood segments. 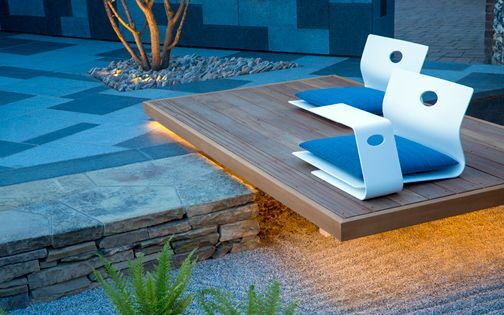 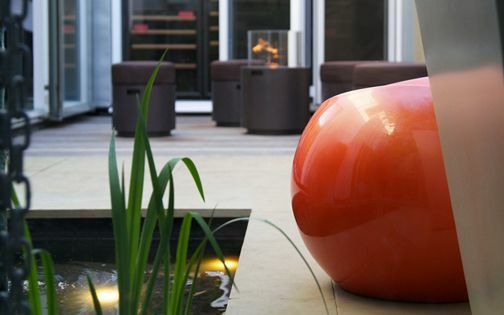 This floating seating structure and its pared-down design elements generate graceful shadows and daylight interplays, expanding precious patio space with further legroom and a mellow lighting afterglow. 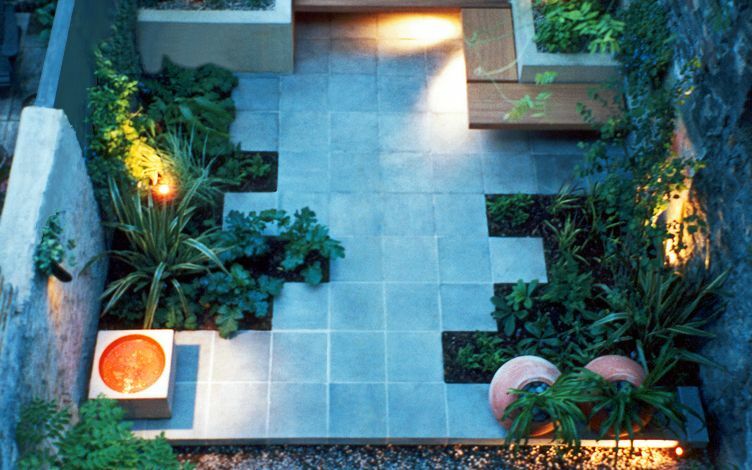 We designed distinctive, interlocking garden paving patterns, producing an invigorating aerial perspective, augmented by rhythm at ground level. 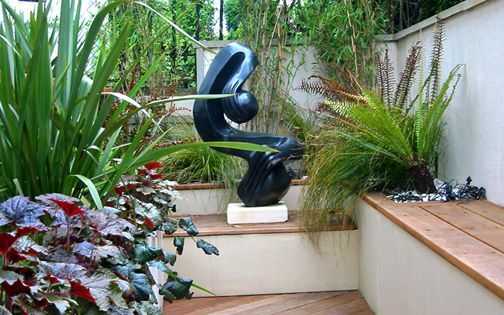 An asymmetrical path, formed amid dynamic planting borders, provides a backdrop for diverse foliage interlayers, where minimalist hard landscaping defines contrasting reductivism alongside thriving, softening woodland flora species. 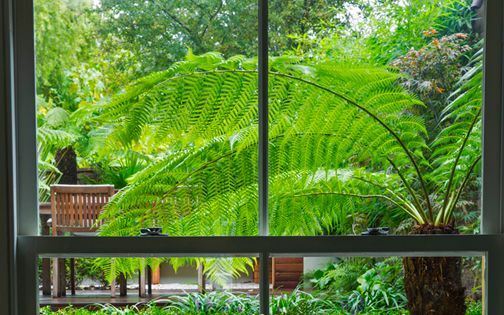 The garden's myriad of Japanese woodland specimens provide height and scale, while defining vital seasonal change. 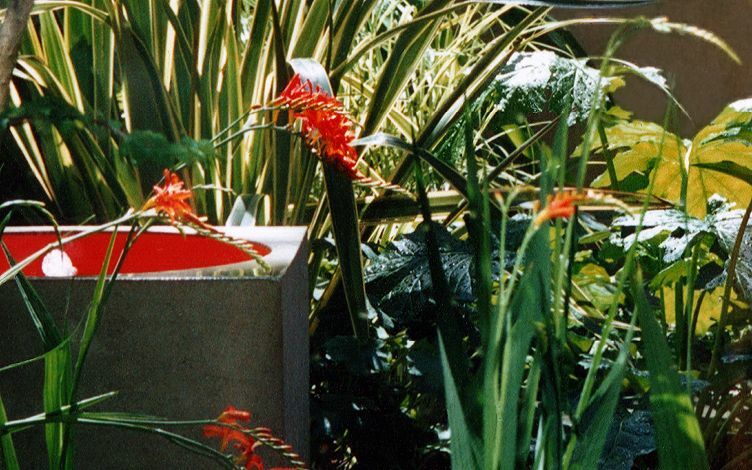 We integrated a broad range of our architectural garden design small tree favourites, such as Angelica, Katsura and Maple tree species, underplanted with drifts of Daylilies, Hostas, Primulas and Rodgersias. 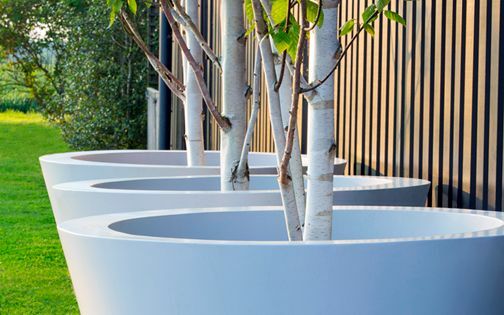 These deciduous trees are paramount in forming natural, organic cycles which sustain wildlife in many contemporary family gardens, where minimalist design layouts embrace subtle layers of foliar deciduousness cohesively, enhanced further by woody shrubs and herbaceous perennials. 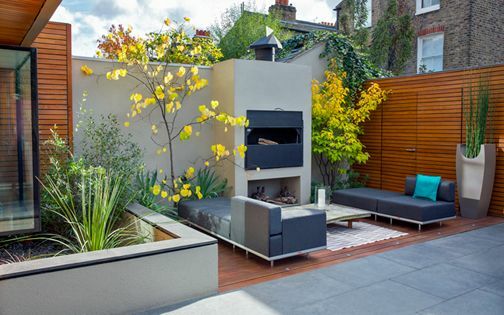 While the garden design's robust, minimalist framework remains uncluttered throughout the year, its distinct autumn and spring foliage invites nature into the private setting of a modern town garden.